Rules of Golf: Rule 10, Order of Play. Who Plays First? "The competitor who has the honor at the first teeing ground is determined by the order of the draw. In the absence of a draw, the honor should be decided by lot." Deciding by lot can be achieved by such means as tossing coins, choosing different size tees from a closed hand, or throwing balls in the air to see which lands nearest to a predetermined spot. Of course, in stroke play there is no penalty for playing out of turn, which is why the convention referred to above has flourished; but it is not according to the Rules. For example, on the index 11 hole in a Stableford competition, player A (handicap 9), scores 4, and player B (handicap 14) scores 5, net 4. If player B had the honour on the hole he would retain it on the next teeing ground even though his gross score was higher than A’s. So, in this example the player whose ball lies on the putting green should play first, the player in the bunker second, and the player on the fringe third. However, as previously noted, in stroke play there is no penalty for playing out of turn and, particularly where it helps to speed up play, there may be a case for inviting the player whose ball is in the bunker to play first. There is also no penalty for playing out of turn in match play, but there is an important difference in that an opponent may immediately require the player who has played out of turn to cancel the stroke so made and, in correct order, play a ball as nearly as possible at the spot from which the original ball was last played. Probably the most famous incident of this occurred during the 2000 Solheim Cup, which brought Annika Sorenstam to tears. Click here for an account of the incident by a Sports Illustrated journalist. I have three more reminders concerning order of play; First, in four-ball competitions balls belonging to the same side may be played in the order the side considers best (Rules 30-3b and 31-4). 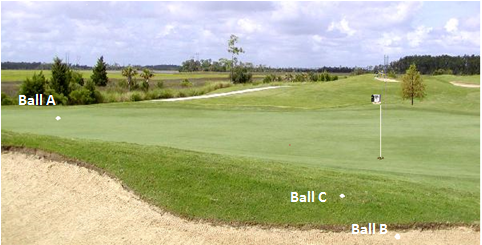 Second, in stroke play, a player required to lift his ball may play first rather than lift the ball (Rule 22-2). Third, if a player plays a provisional ball or another ball from the teeing ground, they must do so after their opponent or fellow-competitor has made their first stroke. Here are some of the comments that I received in during August relating to my free email series, ‘Rhodes Rules School’ where I use photos to illustrate and answer Rules situations that you are likely to encounter on the golf course. You can subscribe here. Nice group of questions - no doubt about the answers when the rules are applied. Bob K.
Remember there is no charge, your email address will not be shared with anyone and you can unsubscribe at any time you choose. Click here to subscribe. Very good insightful information. I've played in many tournaments and caddied on both the men's and women's tour. Who hits first, and who has the honors, can be very disruptive with the group your playing with. There are a few players who are sticklers when it comes to the honor system. Personally, I don't care, because you still have to hit your own golf ball. A lot of the club competition golf in Australia is played on the basis of 'ready golf' to speed up play. Tee off order is first ready should go when the fairway is clear and generally around the green it is get everyone on first even if someone off the green is closer to the pin. The notion of standing around drawing lots because some putts are hard to order in distance from the flag, or because some players have had the same score on the first few holes so tee off order is unclear, is anathema for expeditious golf. If anyone doesn't like this culture, they can go and find a club that does it differently, but such a club is increasingly a dinosaur today. Most clubs agree that the pedantry of the Rule Book on the issue of order of play should be limited to where it is absolutely necessary, such as match play and formal tournaments and championship play - which are generally a small minority of club competitions. I'd be interested to hear comments on how things are done on different golfing continents. I suspect that you are 'preaching to the converted'; most Club golfers play their golf same way that you and your fellow Club members play, regarding order of play. As I pointed out in my blog, there is no penalty for playing out of turn in stroke play, unless competitors have agreed to play out of turn to give one of them an advantage. However, I would argue that there has to be a Rule for order of play. Picture the situation where two players are on the 18th green, with a similar line of putt, and they are both in the shake-up for winning the competition. The player furthest from the hole says, "you putt away while I clean my ball". If there was no Rule this could lead to disagreement, argument, chaos! In the above example if the player on the fringe (10ft) played before the player in the bunker (14ft), to avoid potentially having sand dumped on his line, constitute a breach for agreeing to play out of turn to gain an advantage? In my opinion, in the circumstance that you describe, no penalty would be incurred in thje vast majority of situations. However, I can imagine a scenario, such as on the 18th hole of a major event with the player who was 10ft from the hole in contention for a prize, where it would be judicious to play out in turn. I have a doubt, hope you can help me. In a fourball matchplay where both player of a side are women and both players of the other side are men, if the women side wins the hole, who has to tee off first in the next tee, the men side because their tee is the nearest or the woman side because they won the hole? In the absence of any Condition of Competition relating to your question, Rule 10-1 requires the women to play first when they have earned the honour.